So yesterday I was bored and asked my friend what I should do. She replied "I don't know, draw ASCII art or something!" 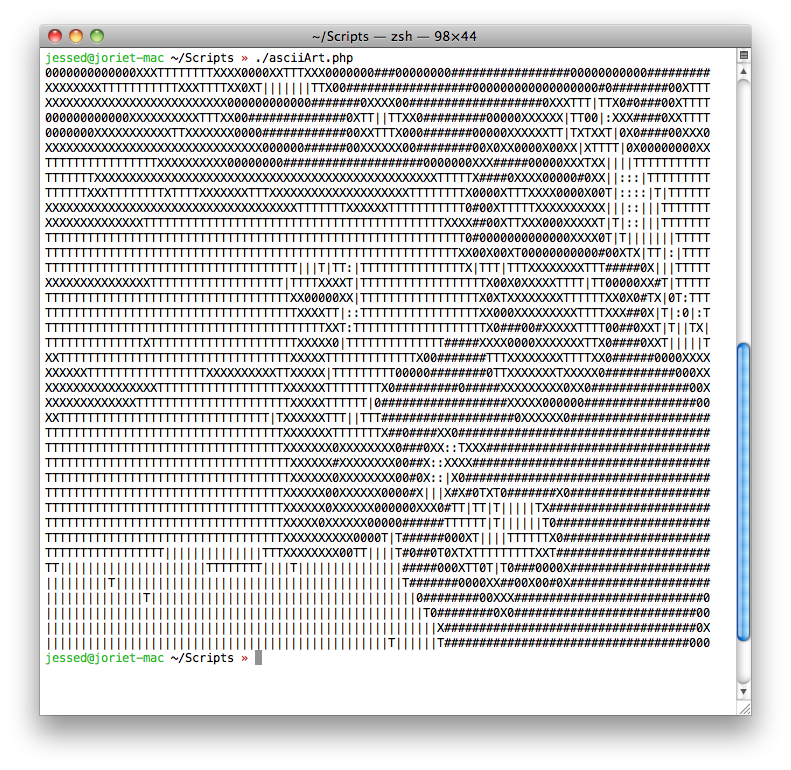 and sitting there with the terminal open I kind of wondered what it would take to write one of those image to ASCII scripts. 20 minutes later I had the following PHP Shell Script! It works by simply sampling the saturation of every Xth pixel and mapping that saturation to a character from an array. There is no nearest-neighboring or anything like that, just straight up sampling. And there you have it! A whopping 35 lines of code. There is a ton of tweaking you can do like changing the array of characters, or adjusting the $scale variable which is simply how wide of a sample it makes. Setting it to 1 for instance should sample every pixel on the Y and every other pixel on the X (so it scales propperly). To the right is a sample output of the script. The script accepts local or remote image paths as the first argument. The following is a simple usage example you can use to get you started. It was a fun little project and I look forward to seeing if/what the internet comes up with for it. Fork me on Github, or post links in the comments! Happy hacking! Nice work man. A simple and clean little thing that is quite a catalyst for the old thought bubbles. I think your not codder. You're artist! :) very funny 34 lines hah!